My hand felt energized as I gripped the leather-wrapped handle of the katana. The shop owner said urgently, "No, not that way!" She corrected my grip, then stood back a safe distance. As I pulled, the long blade slid out of the sheath with that Hollywood sound I'd heard so many times before. I pointed it out straight, then waved it in the air a bit. It was surprisingly light yet strong. The shop owner suppressed her smile of amusement, it looked like she was biting her tongue. Either my "flopping banana peel" technique was not well known here in Kyoto, or it wasn't up to her black-belt standards. After I replaced the blade, she carefully went over the detailed artwork on the sheath, hilt, and handle. The blade itself had a long chinese-style dragon engraved along the middle, with the maker's symbol indented on the other side. I was impressed at its length--at nearly 2.5 feet this was would not be an easy sword to master. It would be easy to lop off your own nose. I bought this cheap replica (only about US$300), but I wished I'd had the dough to buy one of the fascinating swords behind the glass case. I pointed at the one at the top, it was selling for 1.5 million yen (US$18,200)! (Some of the really rare katana could sell for as much as $100,000.) It looked worn, the blade was made of black metal, the sheath was plain and made of wood. She explained that this sword was 300 years old and then went into some of the history of the samurai who had owned it. But her english was poor and I didn't understand much, except that each of these authentic katana had a history, a soul. I imagined its possessor in battle armor, on horseback fighting through a maze of enemies, arrows raining down, blood everywhere. Boyish fantasies maybe, but these swords had lived more than I ever would. Katana are a very special kind of sword. They are made from an ore called Tamahagane that is very rich in carbon. This ore is what gives the katana its legendary lightness and strength. The making of a single blade can take an entire month as the metal is purified and folded over and over up to a thousand times! In the little town of Seki, well away from the tourist path, is the highest concentration of wazamono in Japan. 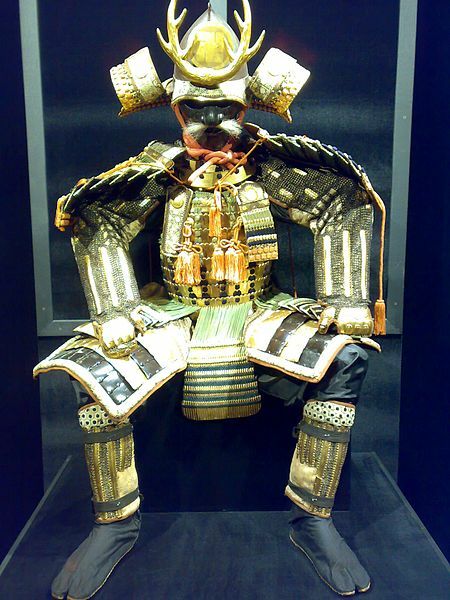 Samurai Armor. Love the antlers! The age of the samurai is looked back on with nostalgia by the people of Japan. The various sho-guns and their samurai warriors had ruled Japan since at least 1160 and they were only outlawed fairly recently in 1873 by the progressive Meiji Emperor. The nobility of the samurai has its obvious parallel with the chilvary of the Knights in the European middle ages. Anyone who has watched The Last Samurai saw essentially how it ended. The samurai disobeyed the Emperor's command to lay down their swords, knowing full well it would mean the end of their kind. The biggest uprising was the Satsuma Rebellion of 1877, and in the film it portrays a poignant ending for the samurai, charging with their swords into the fire of gattling guns, dropping like flies. Modern technology had triumphed over culture and tradition. I gave the ancient katana from the 1700's a final gaze, and headed wistfully off to my Japanese cooking class.